While disaster recovery and business continuity plans are terms we’ve most likely heard before, not all businesses have these fundamentals nailed down. The extent and needs of disaster recovery differ from business to business and the importance of having it exactly right might not be so apparent, so we’re going to try and shed some light on it all. 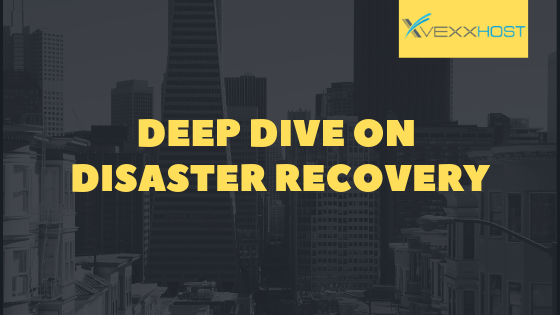 In today’s blog, we’re taking a deep dive into disaster recovery and how you and your company can get ahead of potential threats. What’s the purpose of disaster recovery? When it comes to a disruption of service, both employees and customers suffer – however, if this disruption impacts critical functions to a point where systems are down, the consequences become much more severe. Such an occurence can affect your reputation and cost you customers. For instance, customers expect for any service that they pay to receive to be reliable and secure. If that’s not the case, businesses risk losing credibility in addition to existing or potential customers to their competitors. There’s also the legal aspect that applies primarily to organizations that process payments or store personally-identifiable data. If this organization loses said data, they can be faced with major violations and fines. Finally, there’s the cost of time lost where the company in question is unable to conduct business due to the outage. Depending on the size of your company and the length of downtime, this can cost up to tens of thousands of dollars. All in all, an effective disaster recovery plan can save your business and your customers from these consequences. What are some ways you can prepare? Preparing for the unknown can seem daunting, but the key is to develop a reliable, realistic and detailed plan for the resumption of mission-critical functions dynamically and effectively, and the technology necessary for the implementation of that plan. Although these plans will be specific to the needs of each business, there are certain universal principles to keep in mind. The first, most fundamental step is to be aware of any compliance requirements. Depending on whether you’re an enterprise pharmaceutical company or a budding ecommerce website, you may be required to follow certain regulatory mandates and standards, such as PCI DSS or HIPAA. Next, take the time to identify your company’s most critical systems and assets. Formulate a plan for the quickest recovery of these assets while allocating other less crucial assets in a less rapid, lower-cost solutions. Another key component is testing. Companies should test their disaster recovery systems thoroughly and often. New and unexpected threats can arise every day, so it’s critical for organizations to update their plans regularly. How do you know what’s right for your business? An optimal disaster recovery plan takes into account the individuals, processes, technologies and policies involved in order to develop a solution that is customized to the company’s needs and available budget. In spite of there not being a single perfect plan, organizations can select from a few main options. This option offers companies an active backup site, as the name suggests, This is also referred to as a “hot site” — which is a fully redundant site that mirrors everyday production systems. The production site in addition to the backup site is continuously active and constantly shares the load, meaning that should disaster strike, the backup site will launch into action. This solution results in your data being synched regularly to a ready-to-go secondary site, or a “warm site.” Only particular core processes will resume instantly and the secondary site is prone to some delays. As a result, this is a lower cost option than the above-mentioned active-active. This option uses a “cold site” to securely back up data and can be a solid option for those non-mission-critical applications, or for companies that require the most budget-friendly plan. Disaster recovery is not something that any business wants to be faced with, but sometimes this can be out of our control. What shouldn’t be out of your control is how your company handles it, and that’s why having an effective and efficient disaster recovery plan is vital. With VEXXHOST’s extensive experience in the cloud computing industry, we know how to put our client’s minds at ease when it comes to protecting their data centres and cloud strategies. Contact us today and let VEXXHOST be your partner for all of your cloud needs!